Sitting outside under the Woodland pines with the sound of my fellow counselors’ laughter surrounding me, the conception of what this summer’s theme means to me is starting to take new form. As per usual, this past school year was full of stress and tension, and thinking about “everything clicking” at camp was a faraway dream — right up until I got in the car to drive to Eagle River. Now that I’m here, though, with no need to visualize the tall pines and blue skies that are laid out right before me, I’ve started to think about this summer and, of course, summers past. Along with those thoughts comes the realization that — for me — “everything clicking” starts the minute the counselors start to arrive on the first day of pre-camp. Pre-camp is the six days where our hard-working, fun-loving staff comes together to clean up the camp grounds, put together the waterfront, crank up those tennis nets, ready the barn for the horses, and bond into the team we aspire to be. It’s not only the classic ice breakers, staff meetings, and hours spent on dock assembly that allow us to build our team, though — it’s the fact that we are all working together towards a common goal: to make this summer the best it can possibly be for every camper who steps foot on Woodland turf. Whether we’re telling stories about the past winter over well-deserved meals or teaching each other how to tie bowline knots to secure equipment, every single thing we do during the six days that precede the campers’ arrival is — whether consciously or not — geared towards ensuring the excellence of their experience. 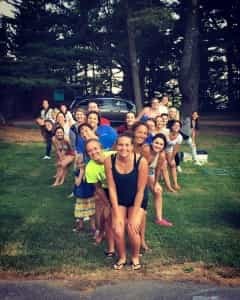 Working together with 20 of my closest friends to make all of the puzzle pieces of camp fit together is six days well-spent in my book — it’s also where everything about my own summer begins to click. There’s no better way to start my summer, nor any other group of people I’d rather start it with. And although the campers may not realize it, the young adults who can be spotted putting up the flag pole and fitting window screens are the start of their summer as well. So when the sun rises early on Saturday morning to meet every bright and shining face that comes down the Woodland road, there’s a staff full of bright-eyed counselors ready to go to any measure to make sure their next weeks at camp “click” in the best way they could imagine.